I am glad we got Rex Spex for our guys. I got them originally for when they went out with us on the bass boat. My gal has an irritated eye and the doc said "no rubbing". 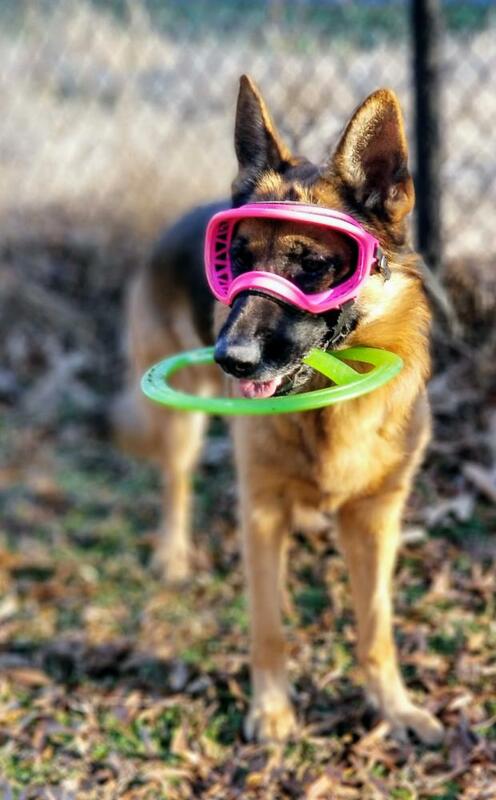 It is much nicer having her play outdoors with the goggles than wearing a cone. Sometimes I put the clear lens in, sometimes I let her wear just the frame. dogbyte, dogfaeries, Hellish and 1 others like this. Pretty in pink. I hope her eye feels better. In September After school I went for a swim by the ocean with my son. a storm was brewing so we got out and headed off the beach. We got pelted with sand the wind was blowing it everywhere - was pretty bad I was glad the dogs were not with us. We could of used some Rex specks we had to run and look for safety was that bad. You never know when they can come in handy. I'm going to give goggles a try. We spend a lot of time at altitude in the snow and water and my dog's eyes aren't dark.